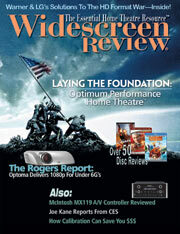 I read Widescreen Review because I like dealing with home theatre. I like watching movies the way they are intended to be seen by the Director at the most optimum grade. I am a student at NJIT studying for Electrical Engineering, and hopefully, I will be working in this fascinating world of audio/video.